I like to try new techniques in my card-making. Therefore when I saw a card swap for Split Negative cards (hosted by Viv - blusky over on Splitcoast Stampers) I promptly signed up. I do like a challenge - and this has certainly been one. After many failed attempts, I finally decided this one was at least acceptable. 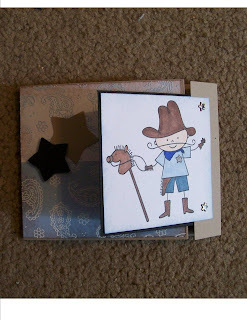 It features the cute little cowboy from the retired Stampin' UP! Cowboy Kid stamp set. The split negative effect is done using the retired Stampin' UP! Pretty Paisley background stamp. The colors are all Stampin' UP! Bashful Blue. Whisper White. Kraft. Black. The coloring was done with my brand new Copics. I have a fun-filled day planned for tomorrow. I'm traveling to Iowa for a Shoebox Swap. This is the third such event I've had the privilege of attending. I always come away with fantastic cards, new friends, and great ideas for future projects. 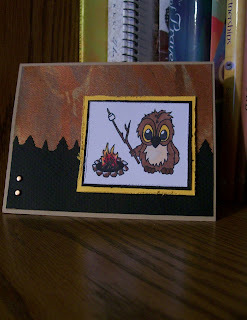 This is the card I created to take to the Shoebox Swap. I used a new-to-me technique (I just learned how to do it this week). I stamped the image from a retired SU stamp set called Summer By the Sea on SU Brocade Blue paper, then bleached the image area with a Aqua Pen filled with household bleach. After it had time to dry, I colored the image using a water-filled Aqua Pen and SU Watercolor Crayons. It creates a soft and delicate image. Add to that some delicate sponging to the background cardstock (Brocade Blue ink or Brocade Blue paper, so it is a very subtle effect). I used my EK Success tree border punch to create two layers of tree line in the background. Some multi-colored ribbon adds some pizzazz. I hope the Iowa Shoebox ladies will have as much fun making this card as I did. Here's another opportunity to put your name in the drawing for blog candy... check out Mary's blog and leave her some love. I just found the most incredible BLOG CANDY that I have ever seen!!! Go check it out........... and sign up!!! Congratulations to Debbie for her Blogaversary, too! I've just recently discovered Card Scents - those little bottles of lucious smells that you paint on. So for this card that I created for a Cakes, Cookies, Cupcakes card swap on Splitcoast Stampers, I just had to give them a try. I put just a little bit of the Cupcake substance on the ribbon I attached to this card, and oh, my goodness! It smells good enough to eat!!! I chose the Stampendous fluffles image for the card, too. And some designer paper and Glitter paint to add sparkle. I have found that I really like cute character stamps - fun images to color and create with. Therefore it is not surprising that I like companies like JessicaLynn Originals, The Greeting Farm, Bella, Hanna, and Whipper Snapper. The card in this post is a Whipper Snapper design. 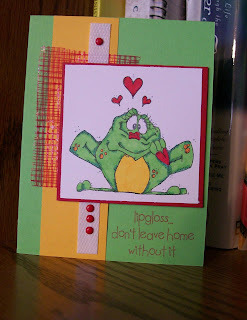 It features the cutest little frog with her lips all puckered up. Isn't she a doll? And the sentiment makes me chuckle: lipgloss... don't leave home without it. 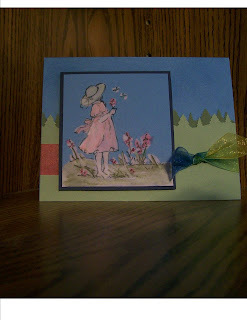 I created this card for the April swapping of The Sisterhood of the Traveling Cards on Splitcoast Stampers. The hostess (Judy) chose a green theme and encouraged us to include a recycled item on our cards. Can you tell what is recycled on my card? There are actually two recycled items. The red mesh is actually a piece of a grapefruit bag. And the white strip is a piece of the shipping straps that often come wrapped around the outside of packages. It was a fun card to create! I recently discovered a stamp company I had never heard of before. JessicaLynn Original Clear Stamps. Jessica Lynn, the owner and designer of these adorable stamps is very personable and a remarkable business owner. I have purchased from her and find her shipping to be fast and her products to be of great quality as well as unique fun designs. 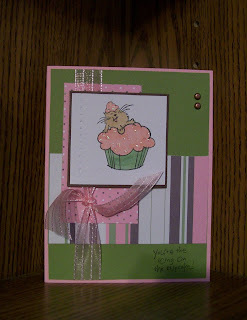 The card I've posted is one JessicaLynn Originals' Brentwood stamps. The Brentwood stamps feature the cutest little owls. And you know how I love owls. This one is her Campfire Marshmallow Brentwood. Isn't he cute??? In creating the background for this card, I used a new-to-me technique of painting cardstock. I took a neutral piece of cardstock and dropped dollops of metallic acrylic paints in 3 colors on it. Then I spread the paint all over the cardstock using the edge of a plastic credit card (the ones they send you in the mail, hoping you'll sign up for one). It doesn't take it long at all to dry. Then it's ready to use. I added a punched border, distressed edges on the raised image, and a couple of copper brads. Now, where did I put that bag of marshmallows I bought. I'm ready to start roasting one. Want to join me? I love paper punches. I have actually lost count of how many I own, but it's A LOT! Whoo really cares how many I have, anyway? So, I was delighted to have a reason to grab some of them and start creating. 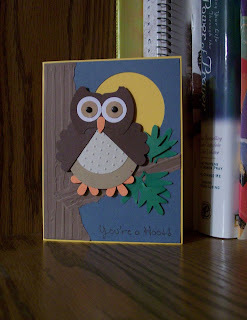 I combined the use of 8 different paper punches, 2 cuttlebug embossing folders, and several colors of cardstock. ...................... Whoo! Whoo! Whoo likes my punchy card??? Wow! Look at the goodies that Phoenix Crafts is giving away!!! Go... now! Run!!! Check this out. If you're like me, you're going to want to win this incredible Blog Candy. I've gotten quite tired of winter this year. Who am I kidding, I get tired of winter EVERY year. That being said, I do like snow... when it first comes, the first three times it comes. But I don't want it to hang around and get dirty, nor do I want it to snow again and again and again. 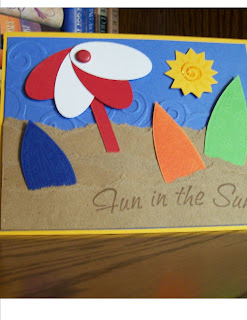 I created this beach-themed card for Sam's I Love the Beach card swap on splitcoaststampers. I used my favorite - well one of my favorite - Stampin' UP! stamp sets to make the surfboards. It's the Pick a Petal stamp set. And I used the Stampin' UP! oval punch to create the clever umbrella. Too fun! I just wish that Stampin' UP! made/sold a punch that would punch out those petals in their Pick a Petal stamp set. So if any of you reading this have connections at Stampin' UP!, would you please suggest that. It sure would make my life easier. Until then... I'll see you at the beach!